Danny Hultzen – LHP – UVA. 6IP 2H 1ER 2BB 6K. Two-way talent focusing more on pitching this year and it’s showing. Deck McGuire – RHP – GT. 7IP 6H 3ER 1BB 5K. Deck now 5-1. Matt Harvey – RHP – UNC. 6IP 5H 3ER 4BB 3K. UNC light hitting offense needs better outings from Harvey to contend. Sean Gilmartin – LHP – FSU. 4IP 10H 7ER 1BB 2K. Rough outing in loss to Va Tech. Chris Hernandez – LHP – MIA. 7IP 6H 1ER 0BB 7K. Justin Wright – LHP – VATECH. 7IP 7H 2ER 2BB 10K. Can’t get over that he’s 5’9. Maybe his opponents can’t either. Tyler Wilson – RHP – UVA. 2IP 2H 2ER 0BB 2K. Drew Pomeranz -LHP – MISS. 7IP 5H 3ER 6BB 7K. 5-0 now. Mike Bolsinger – RHP – ARK. 2.1IP 9H 7ER 0BB 2K. Bryan Morgado – LHP – TEN. 6IP 10H 6ER 4BB 7K. Alex Panteliodis – LHP – FLA. 6.1 7H 1ER 2BB 6K. Cecil Tanner – RHP – GA. .1IP 1H 0ER 2BB 0K. Logan Darnell – LHP – KY. 3.2IP 9H 5ER 2BB 0K. Anthony Ranaudo – RHP – LSU. 3IP 3H 1ER 2BB 4K. They’re being cautious in rebuilding arm stamina. Blake Cooper – RHP – SCAR. 8.1IP 6H 2ER 1BB 7K. The undersized senior is now 5-0. Justin Grimm – RHP – UGA. 5.2IP 3H 2ER 4BB 1K. Taylor Jungmann – RHP – TEX. 7IP 4H 0ER 2BB 6K. THURSDAY Back on track after two off starts. Barret Loux – RHP – TEX A&M. 6IP 5H 4ER 4BB 6K. Loss to Kansas moves him to 4-2. T.J. Walz – RHP – KAN. 7.1IOP 11H 4H 2BB 8K. THURSDAY. Walz now 5-2. Cole Green – RHP – TEX. 7.2IP 3H 0ER 2BB 6K. 6-0. Chance Ruffin – RHP – TEX. 2IP 0H 0ER 0BB 6K. THURSDAY 7 Batters faced. 6 Ks and he hit a guy. Because he can. John Stilson – RHP – TEX A&M. 4.2IP 4H 0ER 2BB 6K. Arizona State and UCLA both get their first loss on Friday. Trevor Bauer – RHP – UCLA. 4.2IP 9H 7R 1ER 2BB 3K. The 6 unearned runs didn’t help. Gerrit Cole – RHP – UCLA. 5.2IP 5H 1ER 6BB 5K THURSDAY. Control issues for the 2nd straight start. Seth Blair – RHP – ASU. 7IP 5H 0ER 0BB 5K. THURSDAY. 1-0 win moved ASU to 24-0 before falling on Friday. Jordan Pries – RHP – STAN. 9IP 8H 3ER 4BB 4K. The man who took down UCLA. Tanner Robles – LHP – OSU. 4.1IP 4H 1ER 1BB 6K. 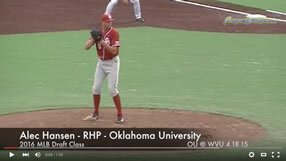 Tyler Waldron – LHP – OSU. 1.2IP 3H 2ER 1BB 3K. Scott McGough – RHP – OR. 3.1IP 3H 0ER 1BB 5K. Eric Johnson – RHP – CAL. 6IP 6H 1ER 1BB 6K. THURSDAY. Sophomore moves to 4-1. Alex Wimmers – RHP – OSU. 7IP 6H 1ER 2BB 5K. 6-0. Strong in Big 10 opener v. Northwestern. Seth Rosin – RHP – MIN. 7.2IP 4H 1ER 0BB 4K. Tyler Burgoon – RHP – MICH. 3.1IP 5H 1ER 0BB 4K. Chris Sale – LHP – FGC. 8IP 4H 0ER 1BB 14K. No mercy on Mercer. Sorry, that was lame. Jake Thompson – RHP – LBS. 8IP 10H 3ER 0BB 8K. Daniel Renken – RHP – CSF. 7IP 12H 6ER 0BB 5K. Matt Purke – LHP – TCU. 7.1IP 3H 1ER 3BB 10K. THURSDAY Nice bounce back start v. SDSU. Patrick Cooper – RHP – Bradley. 7IP 3H 1ER 3BB 5K. Jordan Cooper – RHP – Wichita St. 4.1IP 8H 5ER 4BB 5K. Cody Wheeler – LHP – Coastal Carolina. 7IP 2H 1ER 3BB 10K.